Nicely shaped ends, pleasing medium oak colour which goes with any scheme. Strong and heavy. Most pews can be made to almost any size in between the ranges listed here. Should you require a size not listed please call us on 01737 844 264 or use the contact form available. 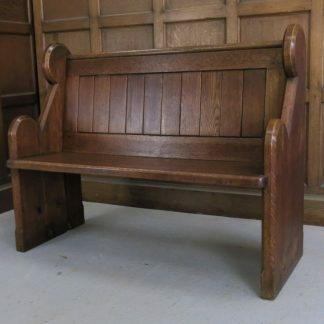 Please Note: Our pews are made to order and can usually be ready within a week. Delivery can take up to 3 weeks for most parts of mainland UK.